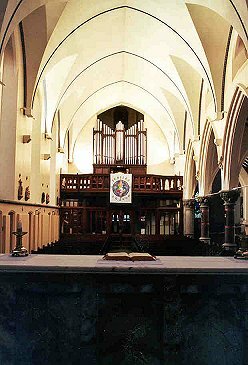 This is without doubt a rather strange organ, but one which contains some pleasing aspects. Tonally there is much to commend the instrument, and with a thorough overhaul it would become more satisfyingly musical. Sadly at present the stop action is erratic and noisy (ominous buzzings!) and the key action not always reliable. These problems are compounded by the organ space beneath the tower being used as a general storage area - it is no surprise the pedal rank sounds distant when all the pipes speak towards the back, right into a mass of cardboard boxes, christmas figurines and plastic chairs. The Great is based on the broad Open Diapason, which speaks promptly. The Principal 4' is similarly voiced, and the two form an imposing, full semi-chorus, easily reaching to the far end of the church. The lack of a Fifteenth is not particularly noticeable. The Clarabella is pleasant with smooth tone throughout its compass, whilst the Dulciana provides a useful quiet accompanimental timbre. The Swell (behind the Great at the same height) speaks openly into the building, and proves a good match for the Great. The Violin Diapason is unremarkable, as is the Rohr Flote, a soft, creamy rank. The Gamba is intensely stringy and provides much needed colour to the organ, whilst the Salicet, for all its name implies, is a broad, slightly stringy, Principal, which forms with the Violin Diapason, a virile ensemble. The Closed Horn (with capped resonators, pierced with holes just beneath the cap) is in fact quite free in its tone, and it speaks with power and strength. 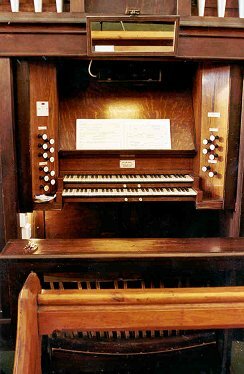 Sadly the Pedal ranks are all but inaudible, and certainly no match for the brisk tone of the Great - the extended rank is mainly sited at the rear of the organ, many feet from the front, and as described above, is in no position to be able to provide solid underpinning tone for the organ. In addition the scale of this rank is rather small, and something larger would, I think, help to provide the Pedal with the gravitas it needs. 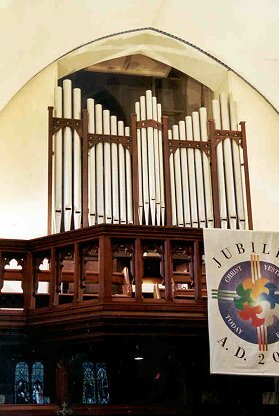 The organ fills the church with broad, warm sound, and I expect this solid tone provides ideal support for congregational singing. It is also well suited to music from the first half of the last century, and I found Whitlock's Plymouth Suite to be particularly effective.